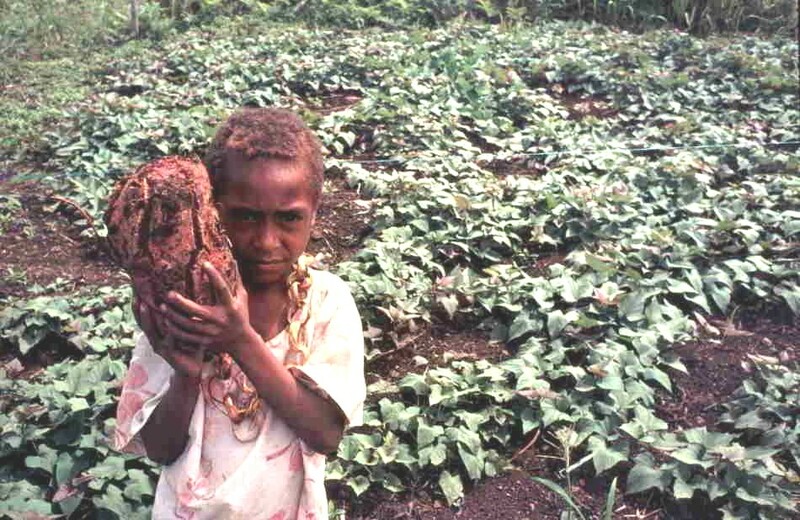 Research on taro and sweet potato was conducted in Papua New Guinea. Sweet potato is the main staple crop in most parts of the country. Field experiments were conducted on-farm and on the university experimental station. The main aim was to increase crop yields using organic and inorganic inputs (i.e. inorganic fertilisers, poultry litter) as well as improved fallows in shifting cultivation systems. A brief description is given below. 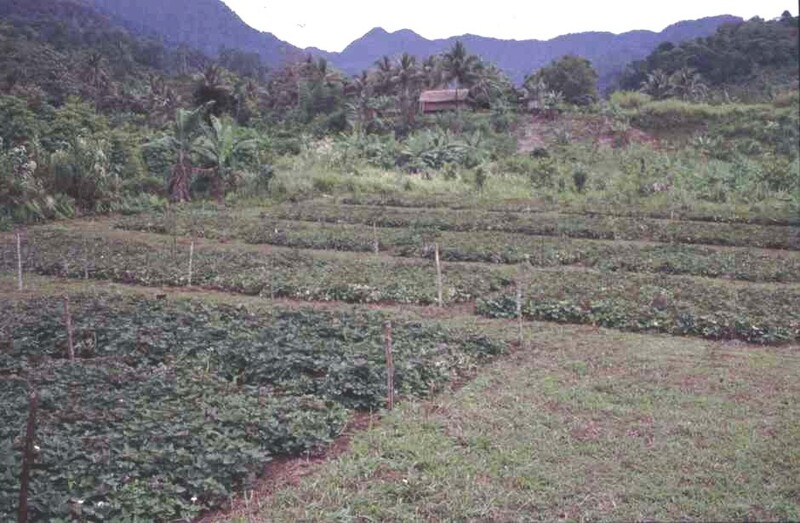 The on farm research was conducted in Hobu, which is about 15 km North of Lae. 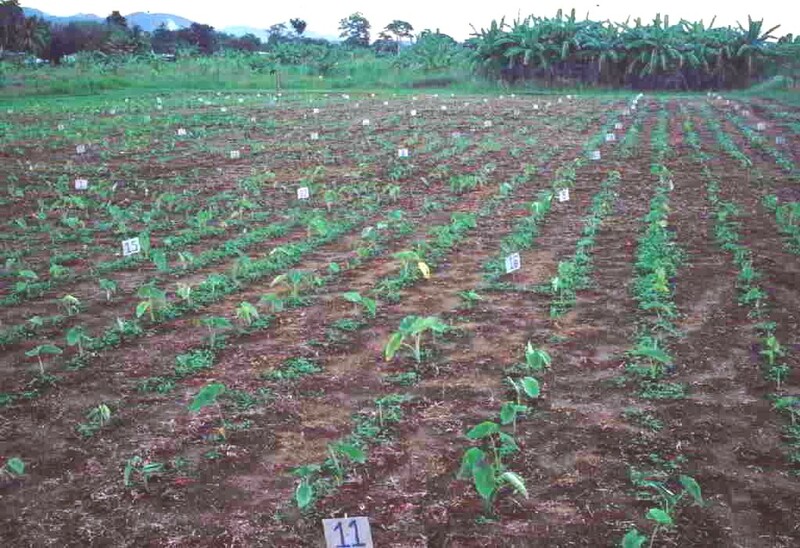 Three series of experiments were conducted: In the first experiment, plots were planted with Piper aduncum, Gliricidia sepium and Imperata cylindrica which were slashed after one year whereafter sweet potato was planted. Sweet potato yield was lowest after gliricidia fallow but no yield differences were found after piper and imperata fallow. 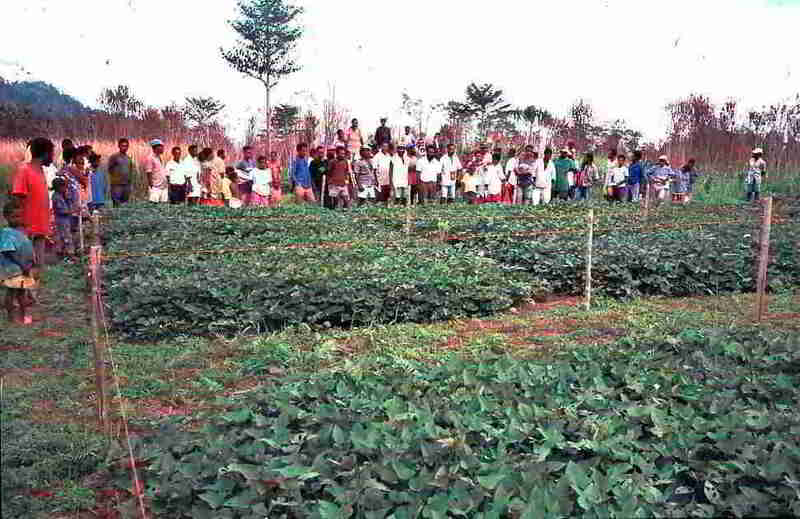 In the second season, there was no significant difference in sweet potato yields. The second experiment consisted of a factorial fertiliser trial with four levels of N (0, 50, 100, 150 kg ha–1) and two levels of K (0, 50 kg ha–1). Nitrogen fertilisers increased yield in the first season but depressed tuber yields in the second and third season. Vine yield was significantly increased by N fertiliser in all three seasons. Potassium fertiliser had no effect on marketable tuber yield but increased non-marketable tuber yields. The third experiment consisted of a comparison between N from inorganic fertiliser and poultry litter at four rates (0, 50, 100, 150 kg ha–1). No difference was found between the inorganic fertiliser and poultry litter and highest yields were found at 100 kg N ha–1. In the second season no significant response was observed. Although yield variation was considerable this series of experiments has shown that sweet potato yield can be significantly increased by inorganic or organic N applications. Sweet potato yields after fallows were variable than after inorganic nutrient inputs. Inputs through inorganic fertiliser or poultry litter may strongly increase or decrease tuber yields. Besides the on-farm trial a series of experiments were conducted at the university station to investigate the effects of inorganic fertilisers and poultry litter on sweet potato and taro. The experiments ran for several seasons and yield, yield components and soil nutrient dynamics were investigated. 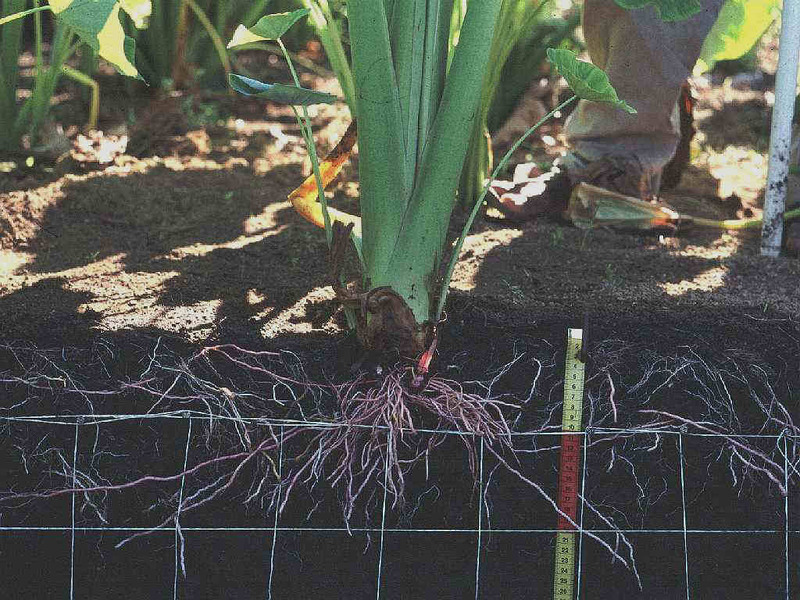 Nutrient use efficiency (see below) and modelling of the nutrient uptake and allocation to various plant components (including roots - see below) were part of the research. Funding came from ACIAR and the University of Technology in Lae. Although the research was primarily on nutrient and yield dynamics, additional research focused on the incidence of nematodes and sweet potato weevils and the effects on crop production. Also the seasonal effects of rainfall was investigated and it was found that sweet potato yields were higher in seasons with lower rainfall. The effects of inorganic N fertilizers on upland taro (Colocasia esculenta) and sweet potato (Ipomoea batatas) were quantified with the aim to investigate relationships between inherent soil fertility, N uptake, N application rates and crop yield. Five levels of fertilizer N (0,100, 200, 300 and 400 kg ha-1) were given in split applications. The yield of marketable taro corms was not affected by N fertilizer but non-marketable corm yield doubled at high N fertilizer rates. High N applications yielded 8 to 11 Mg ha-1 more taro tops. 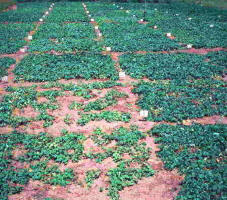 Marketable and non-marketable sweet potato yield was negatively affected by N fertilizers. High N applications yielded 26 Mg ha-1 more vines than the control treatment. Nitrogen fertilizer significantly reduced the harvest index in both crops. When no fertilizer was applied, the total N uptake of taro was 32.0 kg ha-1 of which 9.7 kg was taken up in the marketable corms. At 400 kg N ha-1 the total N uptake was 67.5 kg ha-1 of which 23% was taken up by the marketable corms. Uptake of N in the marketable sweet potato tubers was less than 11 kg ha-1 and for most treatments more N was taken up in the non-marketable tubers than in the marketable yield. Up to 156 kg N ha-1 was taken up with the sweet potato vines. Three-quadrant diagram linking N application, N uptake and marketable yield (left diagram) and total fresh biomass yield (right diagram); I. Yield against uptake (Nitrogen Use Efficiency), II. Yield against N rate (Fertilizer Use Efficiency), IV. N uptake against N application rate (Fertilizer Recovery). From Hartemink et al. (2000). Despite the negative effect of N on sweet potato yield, sweet potato had a higher N use efficiency than taro due to a higher above-ground biomass production. The N fertilizer recovery was 25% for the sweet potato but only 9% for the taro indicating considerable N losses, likely caused by leaching. There is a paucity of information on biomass production and nutrient uptake of roots in tubercrops. We investigated nutrient uptake of taro roots in relation to corm yield and above ground biomass. Fertilized (100-50-100 kg NPK ha-1) and unfertilized plants (n=4 each) were harvested at 126 DAP (mid-season) and 231 DAP (harvest). Rooting depth at both sampling times was < 0.2m and an unit soil area equivalent to the planting distance (0.5*0.8m) was removed from the field whereafter roots were washed on a 0.5 mm sieve. Root biomass at 126 DAP was 0.26 Mg ha-1 (15% of total biomass) in the unfertilized plots and 0.52 Mg ha-1 (13% of total) in the fertilized plots but at harvest root biomass was similar (0.50 Mg ha-1). Root nutrient concentration at 126 DAP was similar in both plots but N, Ca and S significantly declined in the unfertilized plots at harvest whereas B significantly increased with 18 mg kg-1. In the fertilized plot P, K , Mg, Mn and Cu had decreased at harvest whereas Zn had significantly increased. Nutrients in the root biomass as a fraction of the total nutrient uptake were similar at 126 DAP for both treatments. At harvest, however, the fraction of nutrients in the root biomass was considerable lower in the fertilized plots. Striking was the high uptake of Mg by taro roots in the unfertilized plots at 126 DAP (38% of total) and at 231 DAP (36%). The study has shown that the amount of nutrients taken up by roots of fertilized and unfertilized taro was similar at harvest but that a much larger proportion of plant nutrients is allocated to the roots under unfertilized conditions. Hartemink, A.E., M. Johnston, P. John, W. Julius & A. Kerru 1997 Biomass production and nutrient uptake of taro roots. 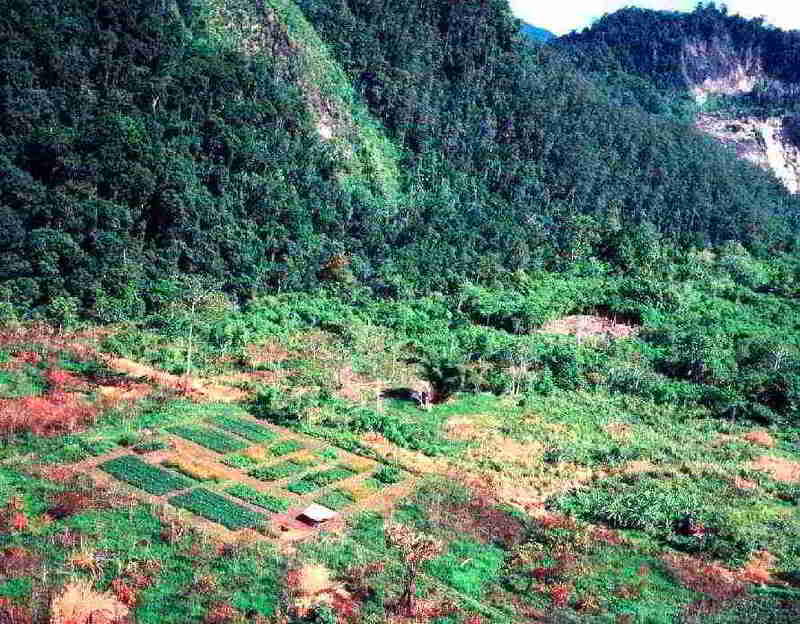 Papua New Guinea Journal of Agriculture, Forestry & Fisheries 40: 6-12.